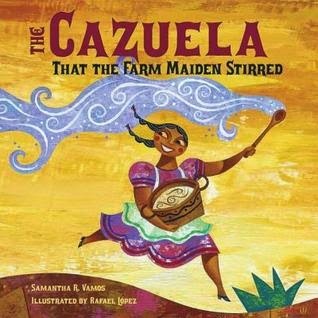 Book: The Cazuela That the Farm Maiden Stirred by Samantha Vamos, illustrated by Rafael Lopez (Charlesbridge, 2011). In this cumulative tale, a farm maiden and her barnyard friends are making arroz con leche - rice pudding - and each animal has something to add to the pot (cazuela!). If you're not familiar with the Spanish words included in this brightly-illustrated story (I was not! ), there's a pronunciation guide in the back of the book and I'd recommend reading it out loud a couple of times before you read it to your group. My audience was not Spanish-speaking, so I would occasionally repeat a Spanish word in English. Cumulative books are great for helping children learn new vocabulary. 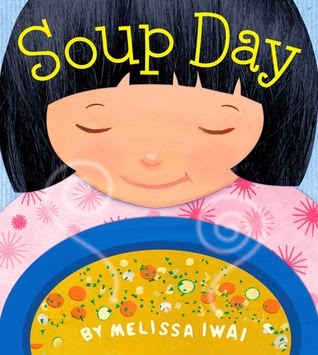 Book: Soup Day by Melissa Iwai (Henry Holt, 2010). On a cold snowy day, a little girl and her mother make vegetable soup. This story takes them through all the steps, from buying ingredients at the market to chopping and cooking the vegetables to waiting for it to cook to serving it for dinner. This is another great book for introducing children to new vocabulary and I like that it clearly shows the steps you follow in cooking. Felt Activity: Healthy Foods. 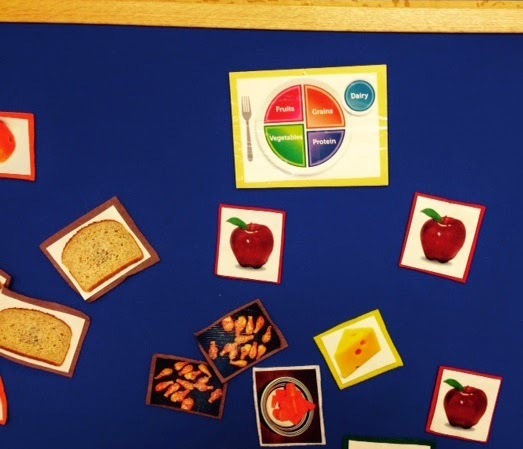 I put up the MyPlate and talked very briefly about the different kind of foods that we eat. I passed out the different felt pieces and went around the plate, calling up the vegetables, then the fruit, then the grains, then the protein, and the dairy. This is a good activity for learning new vocabulary words. Children also practice listening, following instructions, and approaching an adult who's not in their family. 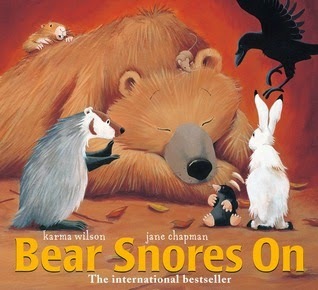 Book: Bear Snores On by Karma Wilson, illustrated by Jane Chapman (Margaret K. McElderry Books, 2002). This fun rhyming story is perfect for this time of year. While Bear hibernates in his den, his animal friends take shelter from the storm, one by one contributing snacks and food for a wintry party. Sharing books with rhyming words helps children hear that words are made up of smaller sounds. 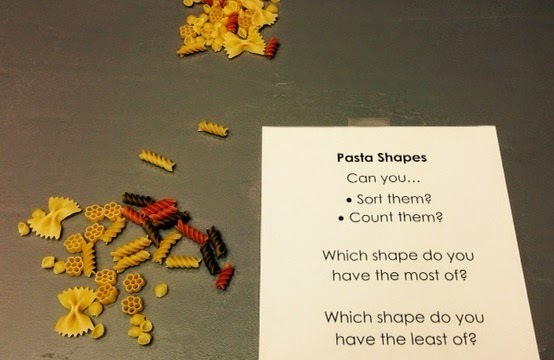 Pasta Shapes: I put out small piles of pasta in different shapes and prompted kids to sort them and count them. Sorting and counting are both math skills and playing with shapes helps with the ability to recognize letters. Bean Measuring. I purchased two large bags of pinto beans and put them out with all kinds of measuring cups. Measuring is a math activity that young kids can help with in the kitchen. Play Food and Felt Board. I also put out a set of play food and dishes and I let the kids explore the food set on the felt board. Imaginative play helps develop vocabulary (you'd be amazed at what words you find yourself using as you go through imaginative play with a child!) 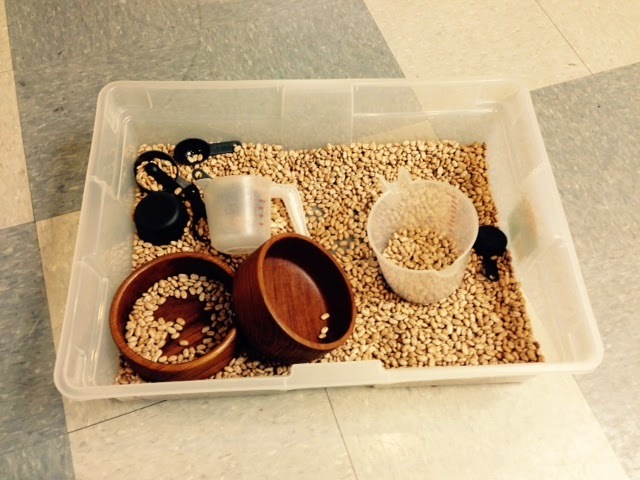 and self-regulation skills like taking turns and sharing. So, I had the best of intentions with this one and the kids did have fun. They mostly stayed at the beans station and the play food station. You can search "preschool kitchen science" on Pinterest for TONS of additional activity ideas.